Muscle is a tissue in animal bodies. Their main purpose is to help us to move our body parts. They are one of the major systems of human and animal bodies. When a muscle is activated it contracts, making itself shorter and thicker, thereby pulling its ends closer. Skeletal muscle, the muscle attached to bones. They pull on bones to make movements. The skeletal muscles move the limbs (arms and legs). They move the jaw up and down so that food can be chewed. Skeletal muscles are the only voluntary muscles, the only ones that we can choose to move. The cardiac muscle is the muscle in the heart. When this muscle contracts it pushes blood through the circulatory system. The cardiac muscle is not voluntary. Muscles are made of many muscle cells. The cells contract together to make the muscle get shorter. The muscle cells know to do this together because many of them get information sent to them by nerves. The cells that get the message from nerves tell other cells that are near them. They tell the other cells by sending an electrical current. 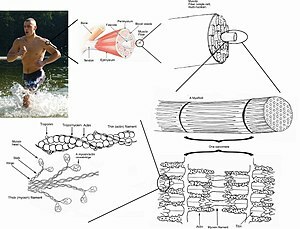 When a nerve tells a muscle to contract, the muscle opens holes in its cell membrane. These holes are proteins that are called calcium channels. The calcium ions rush into the cell. Calcium also comes out of a special place in the cell called the sarcoplasmic reticulum. This calcium sticks to the specialized proteins actin and myosin. This triggers these proteins to contract the muscle. Exercise makes muscles get bigger (see hypertrophy). Exercise also makes muscles stronger. If a person does not exercise, their muscles become smaller and weaker. This is called muscle atrophy. This page was last changed on 24 April 2018, at 12:29.